So while I am on a roll of writing about all things kinda “crunchy”, I thought I might just share another thing that’s close to my heart, hypnobirthing. I had heard about the concept of hypnobirthing, I had read heaps of positive birth books if you like, when I was pregnant with Jai, then I read a book called “Hypnobirthing, The Mongan Method”. I had listened to the track that came with it, tried to get in to work for me… Did all the relaxation techniques, admittedly with less consistency than they probably deserved, but I just wasn’t getting into it. It all seemed to make sense to me but as an effective form of pain relief during labour? I wasnt totally convinced. I felt like I had no time left to do a course but the more I read about it, the more I liked the idea. And it was while I was in the waiting rooms at Bella Mama, waiting to get a pregnancy massage my mum had bought me for my birthday, I noticed a brochure for a hypnotherapist. Again, this is just my experience, I am not expert on this matter, just sharing my story. But when pregnant the second time around, I was exploring all different avenues I could to avoid having the same birth as I did the first time and I largely credit hypnobirthing for our amazing and even, dear I say it, enjoyable, birth experience with Jai (I wrote about Jai’s birth story which you can read here). So the hypnotherapy sessions I went to went something like this, (if you are actually interested in the service please do not quote me on this being totally correct, check with Rebecca at Shine Hypnosis in Auckland or your local service) this is my total baby brain memory of it anyway. For the first session, she put me under hypnosis and worked at kind of unravelling my pre-existing notion of birth in general. Ridding yourself of the stories, expectations and understandings of birth that don’t surve you well or something like that. To be honest, as soon as we did the putting me under hypnosis part I would have pretty much feel asleep if it wasn’t for the baby in my belly going crazy and doing a mad gymnastics session (I was told that is pretty normal as you are generally more relaxed, and so are the muscles tighten around baby, when you are in hypnosis even more so than sleep). The next two sessions, we worked through concepts about self hypnosis, pain relief methods and other concepts which where focused specifically on the birth experience. This stuff was harder to kind of “master” if that’s the right word for it but it’s totally do-able. Some aspects didn’t gel well with me and kind of made me think too hard which took away from the self hypnosis effects, but that’s the thing about this stuff it’s so personal. And that option is there with this approach, it’s like which ever part of it is resonating with you most, use that, focus on that. For me, my “happy place” if you like was all about water… Originally when we practised this technique, I had the beach local to us, Muriwai in mind, the waves and the surf and lots of other really specific aspects. 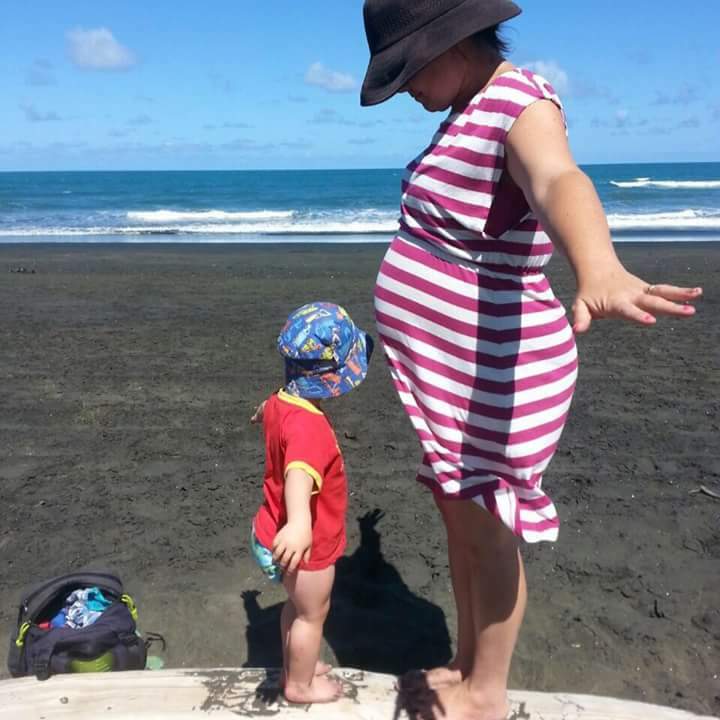 Other times, it was about being in the bath with my eldest son and hearing the water from the taps and him slipping and sliding over my huge pregnant puku! After practising this stuff and having another session with Rebecca, there was an audio track I listened to as I practised self hypnosis in the weeks leading up to birth. As I said before, the time out to rest and recharge, but also connect with my baby and focus on the coming process, was a blessing in itself! When I was in the very, very early stages of labour, it was the early evening, everyone was well asleep, I was excited and anxious and hardly felt like sleeping but put on my track and laid back down for a few hours and did actually manage to chill out and get some sleep again. When my labour was establishing, I was just straight up confined to our bath, which is amazingly deep thankfully! I kept draining all the hot water and making my husband boil pots of water on the stove! The whole time, my hypnosis audio track was playing in the background. When we were in the car on the way to the hospital (this is the second time I’m referring to, read more of the story in Jai’s birth story post), one of the most uncomfortable and difficult parts for me this time, I had my head phones in, eyes closed, curled up in some ridiculous position, trying desperately to imagine fine details of that beach or bath! When we got to hospital and we’re shown our room, the first two things I was barking orders at my husband for was the audio track and water, I jumped in the shower before they had finished admitting me. I also had some essential oils for birth and labour that I did have first time round also and those too are amazing for your “birth kit”. That track played so much my husband couldn’t tell when it actually finished as it was imprinted and repeating in his brain haha I would scream at him, breaking deep hypnosis every 45 mins the track finished as we didn’t work out how to loop it! I suddenly looked up at him with my hand between my legs, “I can feel something!” it turns out it was the bottom of the water sac, which was good cause I was wondering why my babies head was so squishy! She turned and said, “it will be just a few minutes, I will call another midwife, there needs to be two of us for the birth”, before she had finished her sentence, plop! Jai came out, almost totally encaul, inside his wee water sack… He actually hit the shower floor in his delivery haha it was speedy and over so quick. And then, like literally instantly, he tried to start crawling up me while I was on my knees on the shower floor. Crawled right up to my shoulder! And he held on, he was always a strong baby even in my puku. I got helped to my feet, carried Jai to the bed in the room and sat on the bed with him cuddled up to me, smelling his hair and all the other details the visionalisations I had been working on and listening to pointed out. He feed straight away and we had “skin to skin” the whole first hour or more of his life, then while I showered he was weighted and measured and then dresses for the first time by his dad. We left the hospital about an hour later after he feed some more and I had tea and toast the nurse gave me, then we discharged ourselves and got home before sun rise, with a few hours to spare with just our latest addition in the house before we had to pick up his big brother at lunchtime, obviously, we all spent this catching up on sleep, expect for the few hours or so that I just stared at this tiny life that had just come out of me… As you do… ? If you think you might be into hypnobirthing, at least do some research about it… It truly is awesome.. Hopefully it works as well for me if there is a next time (yep that’s right a potential “next time”, I blame both hypnobirthing and placenta pills, we had always only ever talked about two kids until then!) ? I had three sessions with Rebecca and highly recommend her services.. But it doesn’t have to be her, just explore the concept more… Birth seriously doesn’t always have to be horrible and painful, despite obviously being intense and a lot of work!